Labradoodle, Golden Doodles - Are they really the 'Designer Dog'? companion will LOOK like a dog. no one would be the wiser! at least 75% - 85% Poodle usually a lot more! As owners of Standard Poodles we considered breeding Labradoodles. We had heard some pretty fantastic claims about the Labradoodles. 1. They don't shed and are allergy friendly. 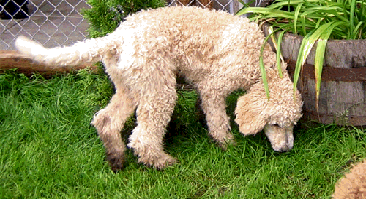 Most Lab X Standard Poodles will shed (about 1 in every litter will not shed). Most will aggravate allergies. It takes multi-generational breeding to breeding that reduce the allergy. This means most Lab X Poodle will shed and aggravate allergies and asthma like any other dog may. Some pups appear not to shed until the adult coat comes in. 3. Lower maintenance breed! I will not have to cut the non-shedding coat! Regular brushing is a must or the dog will get matts and matts can be a breeding ground for parasites! 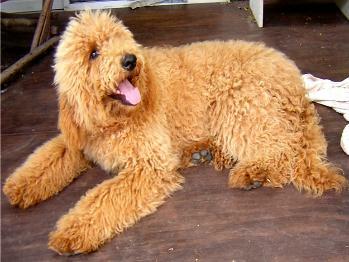 Click here to see Labradoodle Maintence from an Australian Labradoodle Site!!! 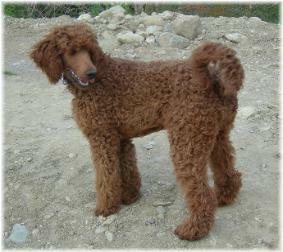 inherit the easy to train Standard Poodle personality. takes more repetitions to train a Lab. 4. They are the latest fad! A new breed! homeless pups in animal shelters. discount prices at animal shelters. generation after generation. This is also called breeding true or having a stabilized breed. 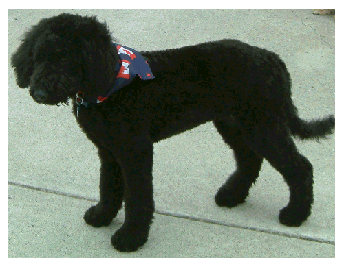 The curly haired Labradoodle looks as he does because his hair is cut into the 'Labradoodle' cut. The thing to remember is ALL puppies are cute. No one can tell what a cross-breed will look like when it is an adult! Remember most of the dogs life will be spent as an adult. 6. They will be healthier because they are not inbred like purebred dogs. Not all Pure-Bred dogs are inbred. Paris Poodles are not inbred! Pure Bred Standard Poodles are statistically the healthiest and longest lived breed of dog. dog. Unfortunately this is not true. A Labradoodle can get the genetic problems common in BOTH breeds instead of just one. far less health problems, (hybrid vigor)." same health issues! Obviously this breeder did not do their genetic research. The bottom line is both purebred and cross-bred dogs are susceptible to potential health problems. MOST importantly make sure your breeder does extensive 10 generation pedigree research.